Welcome Spring, welcome readers! 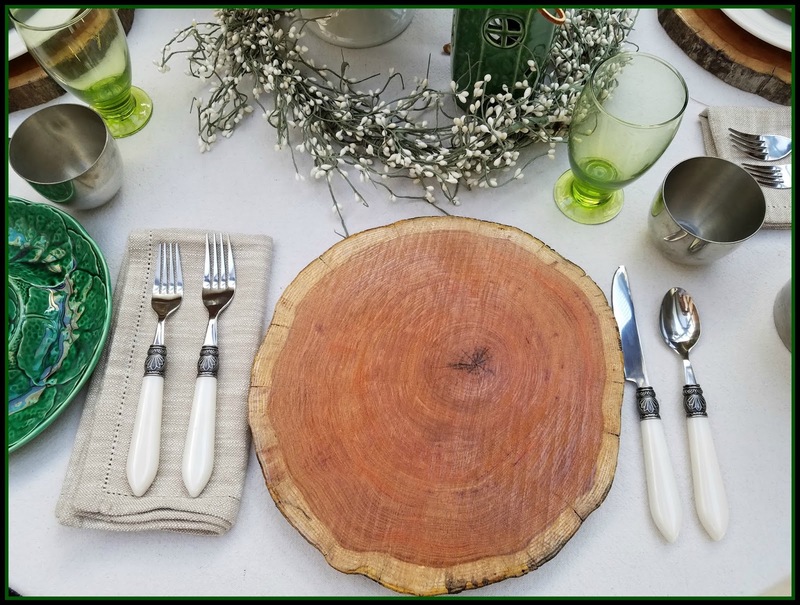 Spring is my absolute favorite time of year, and I am happy to be sharing a tablescape today to celebrate the season. If you're new to my blog, you can see from my menu bar the topics I favor, tablescaping being just one. I especially like to incorporate vintage items into my decor whenever possible, so you'll often see that fusion with new, retail items. What better way to welcome Spring than to explore all of nature awakening? 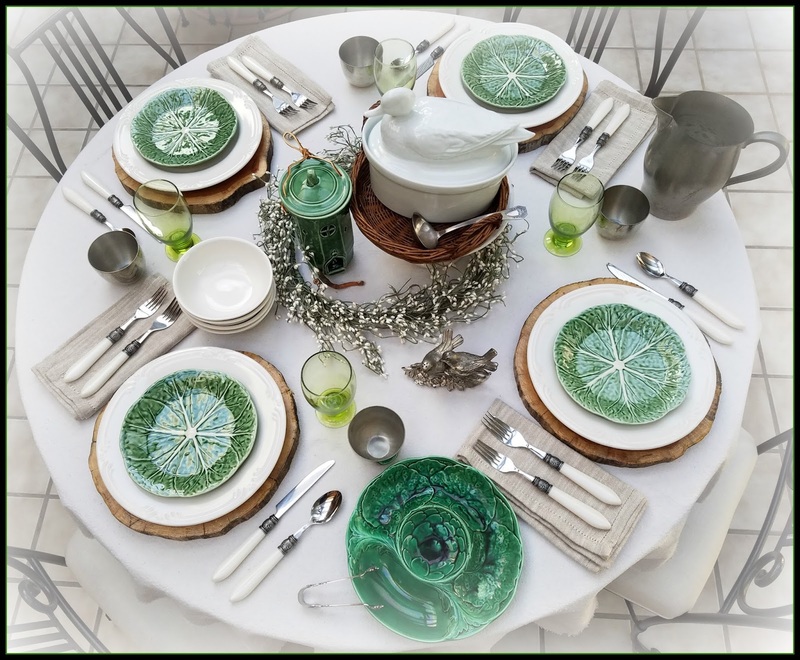 My tablescape today is a medley of many of the textures, colors and figures of things one might encounter in nature's way throughout the early days of spring. Given the premature blooms resulting from much of the country's warmer than normal February this year, it's easy to forget spring's typical awakening. Let's explore that more typical pathway of nature's awakening, shall we? Trees are at their best in terms of appreciating their form and shapes when still bare of leaves, or just as they are sprouting new growth. For this, I felt it appropriate to use my wooden chargers as my base for the plate stack. These locust wood chargers were hand cut and finished by an Etsy seller in Ohio (complete source list at end of post). One side has been polyurethaned, while the reverse is the natural woodgrain. Depending on the mood - polished or plain - either side can be face up. My plate stack began with a classic set of creamy white dishes, acquired with a recently redeemed gift card from a lovely group of friends. They will be my new, go-to set of everyday dishes with my soon to be finished kitchen updates. They represent the wispy clouds that fill the sky as the sun makes its way higher in the Spring skies, as days begin getting longer. 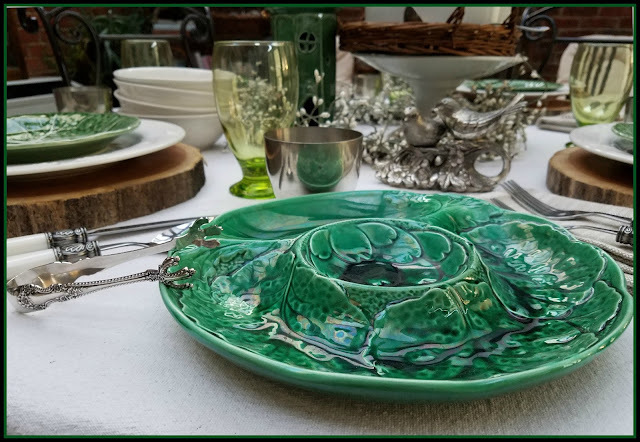 The salad plates used are majolica, in a cabbage motif, perfect for spring, and a nice complement to the green glass water goblets. They mimic the early garden bounty that cooler garden temperatures yield. Paired with the dishware, the off-white flatware proves to be another classic staple for any table. 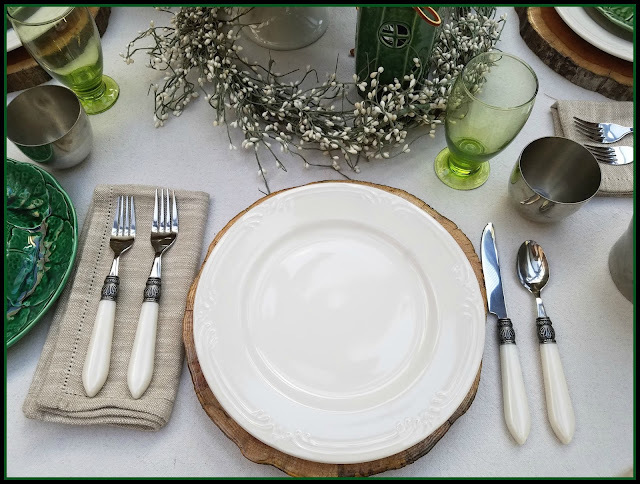 The natural linen napkin prompts a vision of a sandy, loamy soil from which the spring bounty grows. Spring is a time when, if you get out in nature, you are likely to see mallards on lakes and rivers, often times in breeding pairs. Here, I am using my mallard casserole as part of my tableware, nesting within a wicker basket, both elevated on an ironstone cake pedestal. If you are a nature enthusiast, you may have a birdhouse or two which you've cleaned out, hoping for potential tenants. 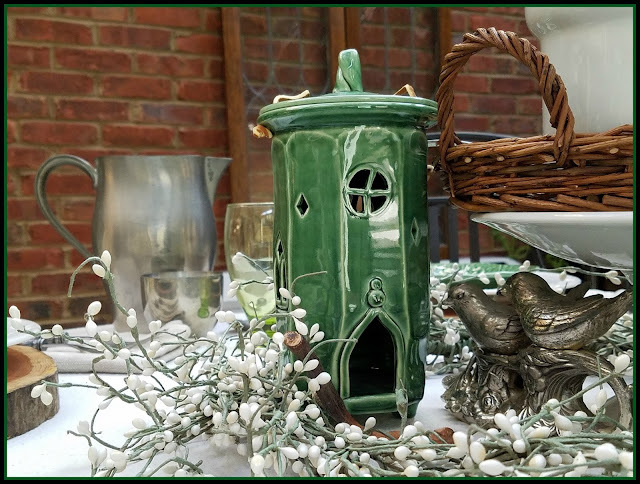 My green birdhouse is new, so I set it upon the table as decor. I've placed a silverplate salt and pepper pair of birds as the tenants near the birdhouse. Pip berry buds are another sign of early spring which you may find on casual hikes or walks in nature's way, swelling among the branches of certain trees such as the willow. 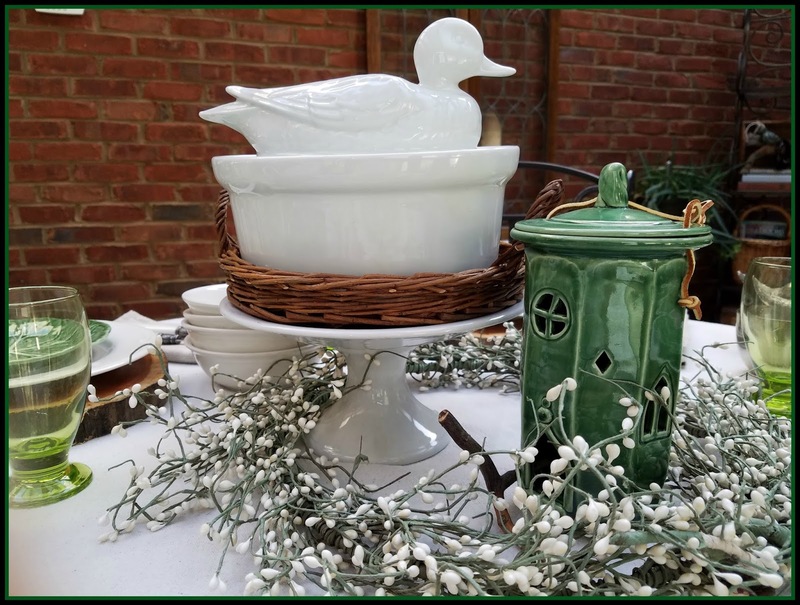 My pip berry garland encircles both the birdhouse and casserole as the table's centerpiece. 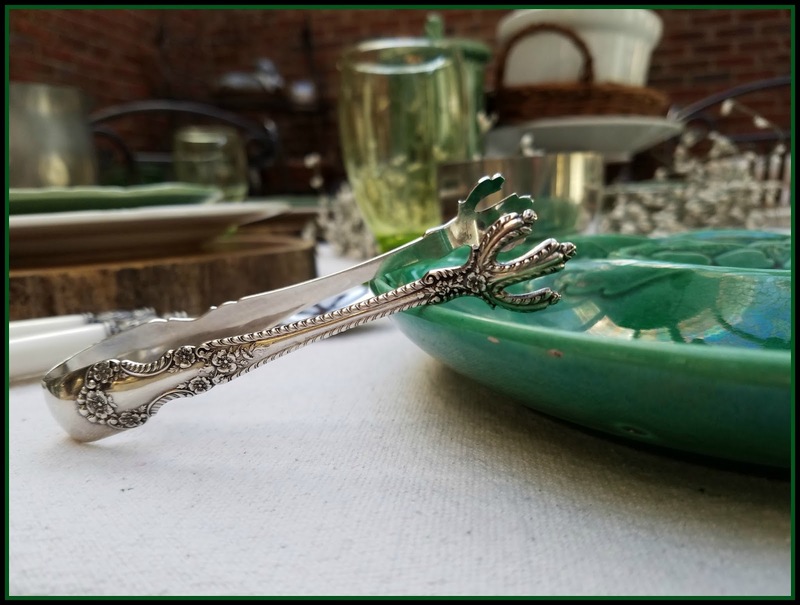 I collect unusual serving utensils because I often host family events at my home and can put the utensils to good use. Delightful yet small purchases, the salt and pepper pair, as well as the talon tongs pictured below, are just two examples of those finds from antiquing ventures. They certainly help carry a nature theme here. 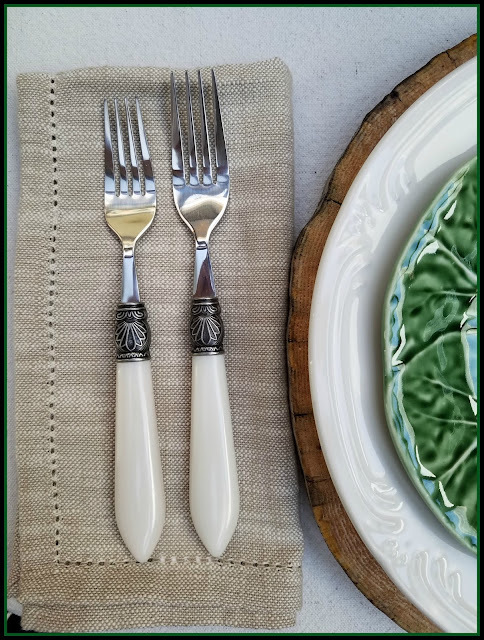 The pewter metal pitcher and Jefferson cups also ground the tablescape in an earthy way. They were a living estate purchase. The serving dish was another vintage find. I love a masculine/feminine appeal to much of my decor, and this tablescape is yet another example of my flair in that direction. 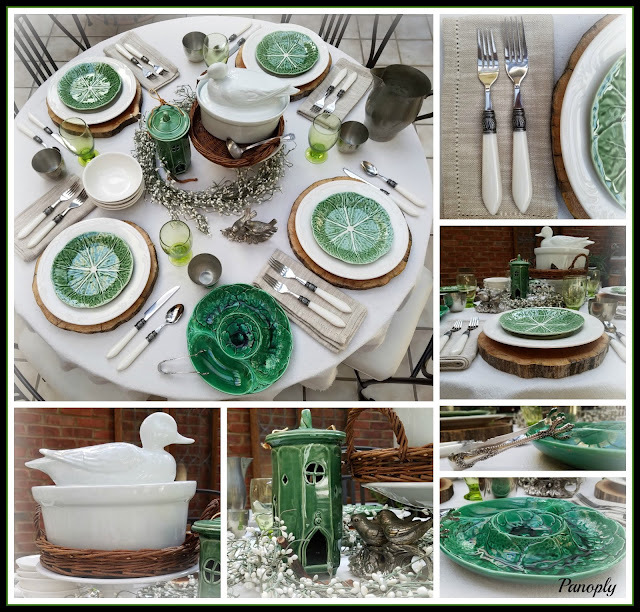 This tablescape could also easily be pulled off as a St. Patrick's Day themed tablescape. 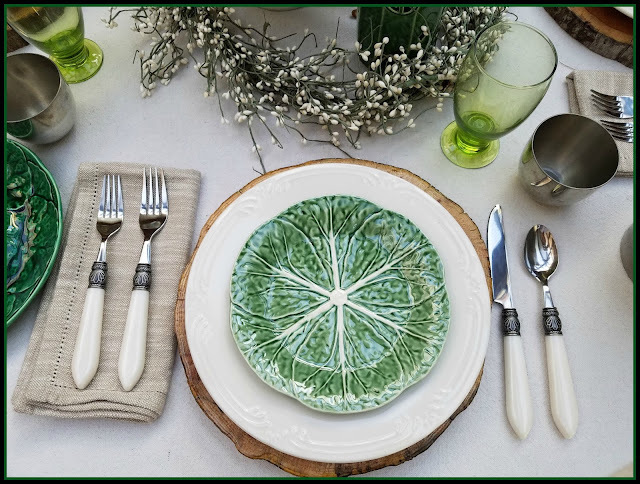 Though not your typical leprechaun and shamrock display, it certainly is a nod toward Irish Folk and Countryside, much like my Irish Country tablescape created here. Thanks for your visit at the table today. I hope you enjoyed my Nature's Way Spring Tablescape. I invite you to browse my menu bar of topics at the top of my blog and, if you find you have similar interests, I'd love for you to come back. I hope you feel welcome, and leave a bit inspired. This week I am joining all the bloggers conveniently listed below, where you can simply click on any - or all - to see a proverbial garden of spring tablescapes blooming. 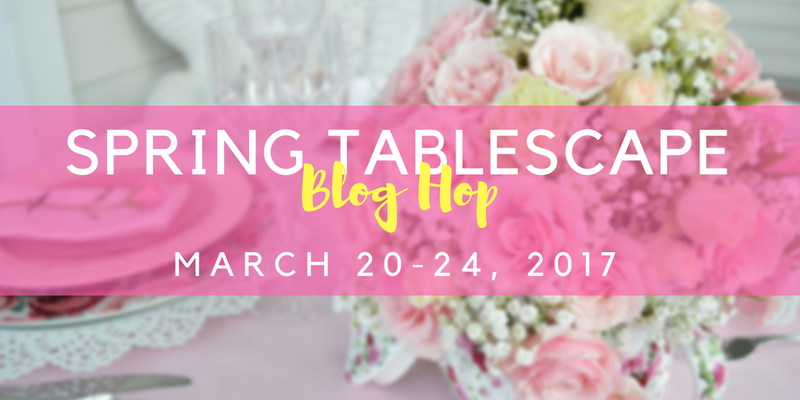 A heartfelt thank you to Chloe from the blog Celebrate and Decorate for organizing and hosting this roundup!